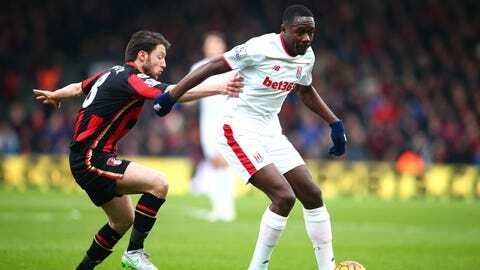 Giannelli Imbula has made a bright start to life with the Potters. Gianelli Imbula’s superb start to life in the Premier League football has earned the praise of Stoke City team-mate Xherdan Shaqiri who compared him with Arsenal great Patrick Vieira. The Frenchman helped the team end a run of four league games without a goal against Bournemouth on Saturday, the Potters winning 3-1 on the south coast. Signed from Porto at the end of the January transfer window for Â£18.3m, the 23-year-old impressed in just his second league appearance, lashing home in the ninth minute to put Stoke ahead. Take a look at our pick of the best images from the weekend. The Frenchman also played a vital role in controlling the centre of the pitch, leading Swiss international Shaqiri to praise his potential. "Gianelli is a young guy, he has a lot to learn but he is a top player," Shaqiri told reporters, while likening Imbula’s style of play to an Arsenal legend. "You can compare him to Patrick Vieira, only Gianelli is all left-footed. "He has that ability to play secure passes all match and that is so important in a midfielder. He has an unbelievably good technique and plays that key pass between the lines. "There is always a little pressure when you move for big money but he is only going to improve here. He makes us better."